VBA to Remove Duplicates in ComboBox Excel Macros Examples Codes: to delete duplicate records from a Combo Box in MS Excel 2003, 2007, 2010, 2013. We will also see the practical example for deleting the duplicates from a Combo Box. Here is the Example VBA syntax and Example VBA Macro code to Remove Duplicates in a Combo Box in Excel. This will help you to know how to delete duplicate records from a ComboBox using VBA. Following is the VBA Syntax and sample VBA macro command to delete duplicate in ComboBox1 using VBA. In this method we will first get the data into Excel worksheet and remove the duplicate using RemoveDuplicates method and then reload into the ComboBox1. 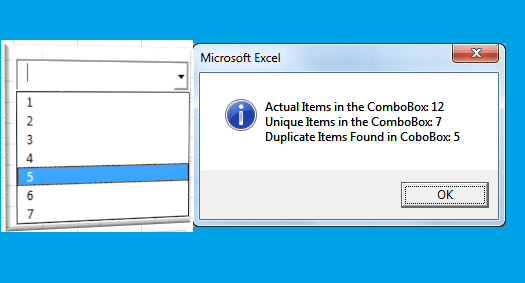 The following Excel VBA macro code is to delete duplicate in a Combo Box. This VBA macro will add a temporary worksheet. And enter the items from ComboBox to temporary worksheet. Then remove the duplicate records in the temporary worksheet. And then reload the unique items into comboBox. Finally it deletes the temporary worksheet. Please follow the below steps to execute the VBA code to delete duplicates in ComboBox. Now you can observe the code initially adding 12 items in the comboBox and then removing the duplicate items and finally you will find the 7 unique items in the comboBox. For better understanding, you can create two combo boxes and populate the unique items into combobox2. No you can clearly see the difference, all items in the combobox1 and unique items in combobox2. Starting Macro program and sub procedure to write VBA code to delete duplicate records in ComboBox. ‘iCntr to loop through the comboBox items. ‘Variable for capturing the number of items in the ComboBox1 initially. ‘lRow to store the last Row in the worksheet after removing the duplicates. ‘adding some items in the combobox. ‘Getting the number of items beore removing the items from comboBox. ‘Getting the values from combobox to temporary worksheet. ‘Clearing the comboBox and reloading the unique items from temporary sheet to combobox. End statement to end the VBA code to delete duplicate records in ComboBox.